Hello everyone! Good news! We moved to our new cage without any forcing and without hesitation. Leaving one cage door open into another worked perfectly, and he wasn't scared of the cage at all! I let him get used to it for a couple of days before moving, he saw me getting into the cage to clear it from inside, and I guess he knew there is no threat in there. I am worried, though, that his food bowls are put quite low and I can't change their placement. Knowing that birds don't like to step down I see that he hesitates to go down and eat, even though I'm sure he's hungry. Also I have got only two perches, one from the older cage and one from the new! And unfortunately I didn't purchase any new perches. I think I will go and collect some branches from non-toxic trees. I also would like to know if I should create a new thread about taming and training him, or I can keep posting updates and questions here? Thank you so much for your support! I already love this board, it's very cosy and friendly here. That is good news. I am glad he is in his new cage. It might be best to create new threads on the other boards, depending on the topic. That way each topic can be discussed separately. That sounds like a good idea. My Chyloe is super tame. I kiss her beak all the time. That is how tame she is. When I bought her a new cage, I tried putting it near her old cage which scared her. For days, I tried getting her used to it. In the end, I just picked her up and put her in it. She sat huddled in the corner for days. I had to put food and water on the bottom because she wouldn't go up to eat out of the new cage's dishes. Of course, she eventually got used to it. Meanwhile, my new friend has adapted to his new cage very quickly, he's quite comfortable with coming down to eat and drink and has already tried to drop the food dish. I think his mischievous and curious personality is coming out! Also, I've read about visual differences between male and female CAG, and mine has light gray tips on his undercoverts! So I guess 'he' could actually be 'her'. What is your experience with this way of visual sexing of CAGs? Is it 100% true? Have you ever seen males with gray tips on their undercoverts? As for the taming and training, I guess we're moving to another thread in the neighbouring board! DNA sexing is 100% accurate but I think the visual sexing via the tail feathers is also pretty accurate, certainly with the Greys on this forum. I have also seen it mentioned in an avian medicine book as a way to distinguish male and female African Greys. Monty (male) has a solid red tail while Mitzi (female) has the silver edging. Re my previous suggestion - don't worry, you can continue posting in this thread if you would rather keep everything in one place. I have found some of the best toys these trouble makers seem to like is cardboard rolls or boxes balls like the little ones that cats play with ( as long and they can't break bits off) etc I've brought my girl expensive toys and she will be scared and have nuthing to do with them. Your story's very simular to myne and RJ and I are becomming good friends. I think I will keep posting here as some small questions come up and still create a separate thread about taming and training! Thank you for your advice! I have already started collecting cardboard rolls and egg holders. I am taking it very slow, because, I have to admit, I need to overcome some insecurity first and I know that Jojo feels it when I approach him. But I'm planning to start our clicker training sessions from tomorrow morning! Thank you for your encouraging words, I wish your bond with RJ grows even stronger, too! I have a big question coming up for you. 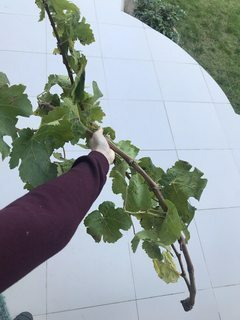 Today I collected some fig and grape branches for Jojo, the only non-toxic branches I could find in our countryhouse garden. But I am not sure what I should do before actually putting them into cage, to make sure they won't be harmful for Jojo. Should I take off the foliage and bark? 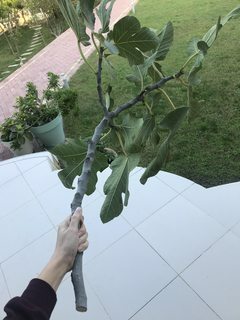 Do you wash or bake your branches before giving them to your parrot? I would like to know. I think, a fig branch could also work out as a perch. Sorry, I am older not so good at working this tablet. My African Grey is 20 years old. There is no male bird around. Last year she laid 1 egg then I knew she was a girl. Now I see 2eggs in her house. Is this bad for her? Will it deplete her of calcium? I am not sure the best thing to do for her health. I don't understand why it took almost 20years to lay a first egg. I have had her since she was hatched out of her own shell. Hello lee3kelly and welcome to the forum. There have been solitary female Greys on the forum who have suddenly started laying eggs, sometimes younger but sometimes it is not until around the age of 20. Don't take the eggs away as that will encourage her to lay more. Give her foods that are good for calcium such as broccoli, almonds and a little hard cheese.